If you aren’t familiar with the love language test, I would highly recommend checking it out! 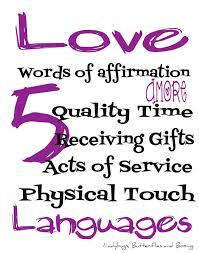 The other three categories are Physical Touch, Words of Affirmation, and Receiving Gifts. I’m a strong believer in getting to know yourself and what makes you tick so it’s surprising that I’m behind on learning about this test. It’s also beneficial to know the love languages of the person you are dating and definitely the one you marry. Knowing each other’s love language can help you understand how to best love the one you’re with the way they need to be loved. Not how you want to love them. I get it and I’m in full agreement. But here’s the one thing that must be at the foundation of all this love talk… GOD Almighty. Without God, true love is impossible to obtain. The reason is because God IS love. You’ve heard me say this time and time again. So no matter how many words of affirmation, gifts, or acts of service gives you butterflies, the love of God is what will sustain you even when your special someone misses the ball. Even when they mess up, the fact that God is at the center of your relationship will bring you both back to the point of it all. So while you master the art of speaking each other’s languages never forget the universal language of God’s love. It covers all borders. It defies all logic. His love overcomes all obstacles and it speaks all languages! Discover the love of God first, master your love languages, and put in the selfless work it takes to conquer life’s challenges… then you will know the awesomeness of LOVE. Anything less than that would be settling and God never intended for you to do that my loves.